Been going here for a few years. This was once a top place to go. The grounds are being over run by weeds and grass not being cut. Half the sites are not even close to be level. During our stay, 4 families that are long term occupants. With 1 family having a freezer outside his trailer. Restrooms and showers, and washer and dryers were clean during the stay. MWR needs to start putting some money into this place. Golf course as always gets the most dollars, it looks like they are building them a new club house. Looking at the previous reviews have to totally agree about the sites being hard to back into. Also the sites are sandy dirt all over. Only saw the camp host once, didn't get to talk to her. Yes, location is great. Lots to do and enjoy in the area and that is why we were visiting. After reading previous reviews, I was apprehensive about what we'd find at the park and, well, it really is that disappointing. We camped in a 40' fifth-wheel. Check-in was smooth and then it all seem to go downhill. Very tight getting through the one-way road because of cars parked along the way. We had a horrible time backing into our site; narrow road and very narrow site. Once in, it was all sandy dirt. No exaggeration, I was filthy after having to crawl around the embankments that surrounded our slides to hookup. (I should've taken pics.) And then we discovered it was only 30amp. Thank goodness it wasn't summer so we didn't need AC. (We made reservations through DoDLodging, so you never know...) Had to park our truck in the parking lot at the clubhouse because it wouldn't fit at our site and no where to park nearby. Not a big park and quite a few permanent campers, but sites were pretty much free of clutter. The thing that shocked me the most was that the first two groups of people we met were just plain rude/unfriendly. Couldn't believe we were at a military campground. Wifi didn't work. Thank goodness most of the time we were gone enjoying Monterey and Big Sur. When we did watch TV we had to pause the show when planes took off, but it wasn't too often and considering how many air stations we've been to, it just doesn't bother me. Laundry machines were good and decent cost. Oh, one last thing. The camp host was out quite a bit and busy. She really kept up with things. 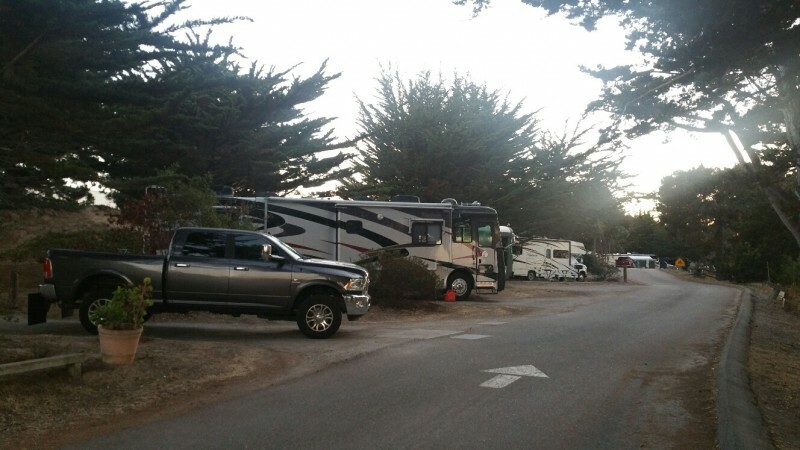 This campground is popular because of its prime location but that is about the only thing to justify the $30 a day rental fee which is top dollar among military campgrounds. Many of the sites do not have 50 amp electric and many are too small for today’s large RVs. The sites at one time were asphalt but that has long since worn away. Now it is dirt and gravel. A new layer of gravel is needed. The campground road is one-way and narrow and the narrow width makes it difficult to back into many spaces. Since the golf course was rebuilt in 2009, the overflow area was converted to part of the new course – there is no overflow now. 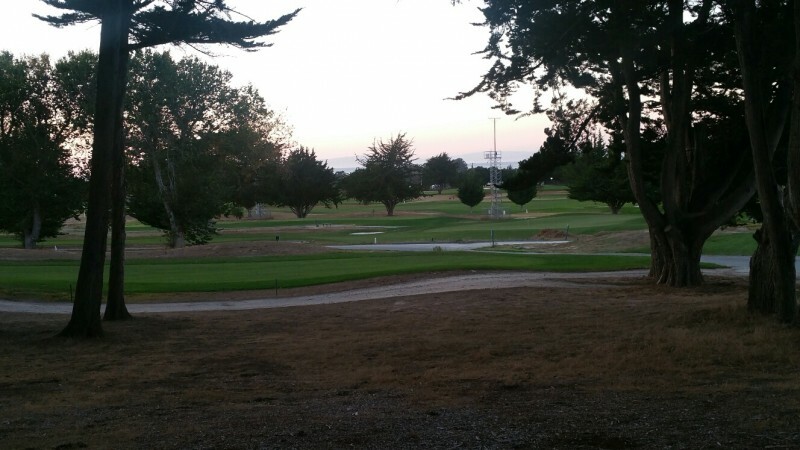 Several reviewers seemed to like the campground because of the beauty of the surrounding golf course. Most of the immediate area around the campground is an industrial area. One side of the campground has an ugly green fence about 8’ tall which hides the adjacent golf course (or maybe it hides the campground from the golfers.) The grass receives little attention and is brown with a lot of bare spots. Contrast that with the nearby golf course. I tried many times to connect to the free Wi-Fi during my 5-day stay and was never successful. I am using my air card. Right now, 32 of the 38 available sites are occupied. This weekend, the campground is full. The first time I was here, in 2004, it was also full but I was able to stay in overflow. With the high occupancy rate and fees, I would estimate that the annual revenues are more than $250,000. Where is that money going? O.K., end of rant. The bath house and laundry were refurbished about 5 years ago and are in good shape. This is the only improvement I can identify in the last 10 years. The Commissary and Exchange are at Fort Ord, an easy 6 mile drive north along Highway 1. Lots of things to see and do around Monterey which is a pretty town on beautiful Monterey Bay. We will visit the aquarium, one of the best I have seen. I enjoy walking along the waterfront near Fisherman’s Wharf and Cannery Row and watching the seals on the rocks. We will also spend a day touring the Pacific Coast Highway and Big Sur. The airport noise here is surprisingly low considering that we are right at the end of the main runway of Monterey Regional Airport. The concerts at the fairgrounds this Memorial Day weekend are much louder than the airplanes. At check-in, I was given a Customer Satisfaction Survey and asked to fill it out during my stay. I asked her if she knew of the Military Campgrounds website and she answered, “No.” I feel that everyone managing or working in a military campground should be familiar with their particular section of this website, especially the reviews. Positive; Price, clean laundry room, folks camping respectful and quite. Negative; Tight spaces and short, right at the end of Monterey Airport runway so 0530 wake up w/jets taking off and landing, signage off road says "Monterey Pines Golf Course" makes no mention of RV park, once you figure out that the RV park is actually behind the golf course you have to go into the pro-shop to check in, again no directions or signage/think of it as a scavenger hunt. We checked in late afternoon and had a little wait at the golf club house. The campground is fairly small and cramped. It is like they had some space left over and wondered what they could do with it. All sites are back-ins and some locations are harder to get into. We did get a full hookup site with 50 amps. We were assigned a spot that definitely was not level. I had to raise the front end a little over six inches. It was a convenient location to tour around Monterey. I felt it was a little overpriced all things considered. I've stayed in better and worse military campgrounds. The local area is beautiful. There is no minimum stay limit but the manager would not give me a reservation unless I stayed two nights. If the grass got watered it would be a much nicer place for the price. It is rumored that this campgrounds is going to be closed down. J.P. left this review using the Directory software: - Spent one night here. Great location, getting a 33' fifth wheel towed by a long wheelbase truck into a site is moderately difficult. 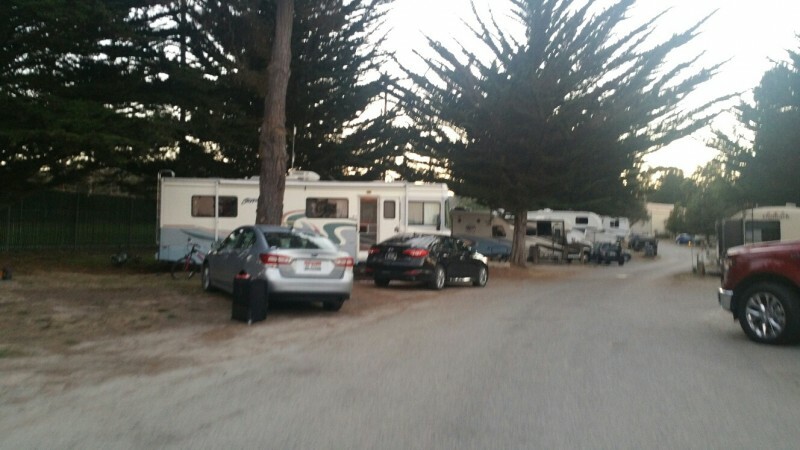 However when I stopped by the clubhouse after dinner when I asked the night manager about an ATM, and perhaps package sales or a mini mini-mart catering to the Campground, I was informed that none of that would happen, and "Enjoy it now, it's (the Campground) going to be removed". Location & Golf; outstanding. RV park is located in middle of golf course; be prepared for occasional golf ball hitting around or on your RV or vehicle. This was our fifth visit and the park is slowly going down hill; with the exception of a upgrading of restrooms nothing has been to this campground in last five years. Landscaping maintenance does not happen; many sites and public area's are over grown with weeds and have not received any care at all. Roads are a mix of dirt, rock and blacktop with pot holes; every year we hear about up coming improvements but they never happen. WiFi was added but does not work; hoist and management are aware but say nothing can be done to correct it.Some site are not level and require major blocking (both side to side and fore to aft leveling). There are zero play area's or activities for children or teens. I would really like to give this park 4 or 5 stars because of location and staff assistance but MWR is just letting it go to pot. Current price $30 per night with rumors of increase to $35; this is great price for the area but way over priced for a military campground in this condition. We stayed at this facility with our tent trailer about 4 years ago when we drove across the country. This summer we flew from DC to CA and wanted to tent camp. NO TENT CAMPING IS ALLOWED, even if a space is available. I wanted to use the overflow area, but I was told no longer exists. 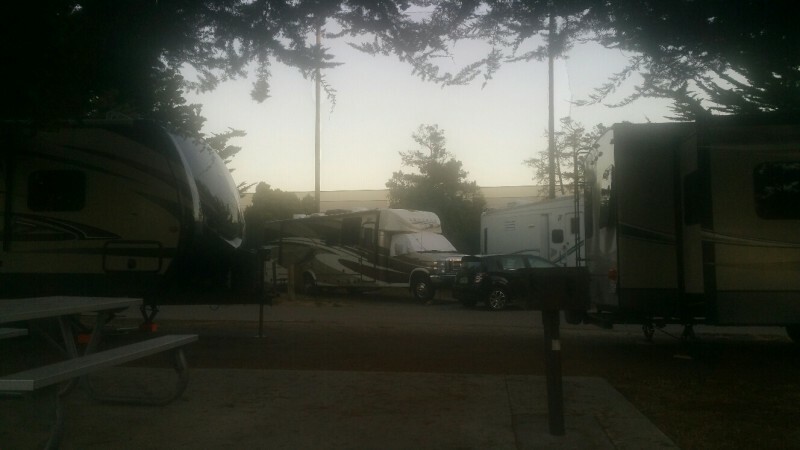 We stayed in a nice county campground at Laguna Seca Raceway. Very quiet as there wasn't a racing event going on, and only about 5 miles from this facility. J. A. left this review using the Directory software: Whole lot cheaper then staying in motels or private campsites. Made visiting with 94 year old mom pleasure and not sleep on home floor. Bathrooms and Showers excellent, as long as you go turn on heat manually 30 minutes before showering, when OAT is low! Do recommend having reservation. Rather high rates for little in return. Rates go from $24.00 to $27.00 on July 1st. Not entirely sure what they spend the money on. Poorly maintained and lots of weeds at each site. Road is full of potholes, but at 5 mph can be managed. Carlina is very helpful. Sites are small, but do have a small patio site and charcoal grill with picnic table. Airport is close by and can be somewhat noisy. We are Air Force, so it doesn't bother us, but may bother those who aren't used to an airport so close. Commissary and BX are on Fort Ord and pretty nice. Location is great. Not much on views, but a short drive to the beach and downtown. ALL PREVIOUS REVIEWS ARE ACCURATE...A NICE PLACE FOR A FIRST CLASS RV PARK!! FIX THE ROADS!! RE-VAMP THE SITES!! TOO TIGHT, TOO CLOSE FOR MOST LATE MODEL RVs WITH MULTIPLE SLIDES ETC. GOLF NOT OPEN, BUT LOOKS EXCELLENT, AND AS BEST I CAN SEE ABOUT THE ONLY "AMENITY" ONCE IT OPENS....NICE FRIENDLY PEOPLE IN CHARGE. THE CAMP HOST TOO. Access is via a long relatively narrow, gravel, "street" that has some potholes. The baths were clean but unheated and dammed cold. There was no wifi but Verizon and AT+T both had good reception. Our arrival was warm welcome and very friendly, helpful check in. Alisa @ MWR was most helpful in getting our aquarium tickets. The golf course is closed due to a long term renovation so if your a golfer please check before coming to golf. The airport behind the golf course made some noise but not overly so. Make sure you have the gate codes after 1800 hrs. The area fuel was much more expensive than that on the interior only 50 miles inland. S.R, left this review using the Directory software: May be a better facility once renovations are completed. A little disappointed considering everything in the area. Small sites, seemed to be crammed in among a lot of people who are staying long term.